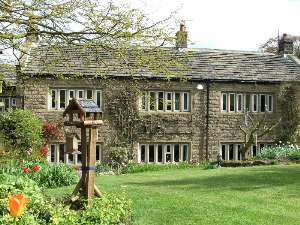 Lumb Beck Farmhouse Bed and Breakfast01943 830400work Bed & BreakfastExperience a real escape, a world away from the hustle and bustle of everyday life. Come and sample the silence. Lumb Beck enjoys an elevated position affording views of the Moors, the Wharfe Valley, Bolton Abbey and Beamsley Beacon. Built originally in 1670, the house has been completely restored and affords every modern comfort. We take special pride in our gardens, which we have created for our visitors' delight. We do hope that you make time to relax and enjoy them. Weather permitting, breakfast may be taken in the Summerhouse. Although it is the epitome of a rural retreat, Lumb Beck is within 20 minutes drive of Ilkley, the floral Victorian town, Skipton, a busy market town (with its own Castle to explore!) and Haworth, home of the Bronte family. Further afield, and yet still within easy driving distance are York, Harrogate, Leeds and Saltaire, the latter created by Sir Titus Salt and recently designated a World Heritage Site. For those wanting to escape away from it all, meander along the River Wharfe or discover the beautiful Yorkshire Dales - all on our doorstep. The possibilities are endless. A multitude of walks on our doorstep. Moors and rivers and Dales Way. Relax and unwind in our award-winning gardens. Lots of high quality restaurants in the area. Children welcome from any age. Take A65 out of Ilkley. Left up Cocking Lane for 2 miles. Left up Straight Lane at crossroads, 1 mile to property on left.